My uncles were tough, salt of the earth types that didn’t accept anything but your full effort. They valued grit, resiliency, and the ability to solve any problem without whining or complaining. These were hard men to please and even harder to impress. They could repair any tractor or machinery with their own hands, fixed farmhouses and barns, and built cabins and decks with equal ease. When they could, they cut their own timber and milled their own lumber. So, when it came to their rifles and optics, they were demanding. In the rare moments that I would get a glimpse of pride from any one of them, it was often related to one of their coveted bolt action guns. There were no synthetic stocks or stainless steel for these men. It was well cared for wood and meticulously cleaned and blued barrels. In each of their homes, a windowed gun cabinet held a place of honor and respect. In hindsight, I might even call them shrines. My uncles revered their rifles, and more importantly, the ability to wield them responsibly and with lethal proficiency. I wasn’t allowed to shoot or handle one of these prized bolt actions until I proved competent with my Grandfather’s open-sighted .30-30, off-hand no less. Like I said, these were hard men to please. I credit whatever marksmanship abilities I now possess to their tough standards. As for scopes, my uncles were equally unforgiving in their expectations. With very few exceptions, the only optics that earned a place in their gun cabinets, were scopes graced by a Gold Ring. As a boy, I vividly remember gazing longingly through the windowed cabinet doors, hoping to one day earn the right to shoot one of these cherished rifles. The lights hitting the wood and steel of the guns just right. The gold ringing the objectives of nearly every scope standing out starkly against the matte black of the scope bodies. To a youngster, obsessed with hunting and the outdoors, it was a mesmerizing sight. To this day, I don’t know whether they didn’t know or just didn’t care about European optics. I’ve never asked. All I know is that to them, there was only one brand that met their relentlessly demanding world view: a Leupold Gold Ring. And so, more than two decades later, when I was fortunate enough to get the opportunity to tour the Leupold factory in Beaverton, OR, it was a symbolic moment. There I was, behind the scenes of the very optics that figured so prominently in my upbringing as an outdoorsman. I only wish I could have had my uncles with me. I could spend the rest of this article describing the eye-opening scale of Leupold’s manufacturing facility. Or the demanding engineering and environmental testing processes that go into every scope that goes on a gun. Which by the way, if it ends up on a gun, it’s built in Beaverton. No exceptions. Or, I could try to describe the impressive industrial spectacle that turns raw materials into precision designed components, or the meticulous hands-on American craftsmanship that goes into many of the internal, and therefore integral, parts we all take for granted in our rifle scopes. I could also wax philosophic about the “Punisher”, Leupold’s ruthlessly abusive impact testing system that routinely spits the guts out of many of the scope brands you might otherwise think are worth your hard-earned dollars. Trust me when I say that price does not always equate to durability. The so-called clearest glass doesn’t mean squat if the scope is as fragile as the box it comes in. But no, that material has been covered in-depth before, and by others. I took something far more important and impactful away from my tour. Something that will always be with me. In truth, it always was. And that is, the people. The people that build Leupold scopes right there in Beaverton, are what make their scopes and their brand, what it is. And why, until the day I pull my last trigger, Leupold scopes will find a home in my gun safe. At every work station, down every hall, and around every corner, I encountered people relentlessly committed to their jobs and to delivering on the promise of the Leupold brand. In many cases, people that had been with the company for decades. True craftsmen and women. But even more importantly, as we moved from one area of the factory to another, I consistently met people that, regardless of their role, would have met the unforgiving expectations of my uncles. That is not a statement I make lightly. To my uncles, an uncompromising work ethic was to be expected, not celebrated. Do it right, or don’t do it at all is an ethos imprinted on my psyche. They demanded everything you had and more, but they also led by example. I guess intuitively, they knew that’s what they were getting when they bought a Leupold scope. Well, dear reader, now many moons on from when I stood gazing into those gun cabinets, admiring those gold adorned scopes, I can tell you with certainty, they were right. The company’s commitment to quality, reliability, craftsmanship, and in-the-field performance is not just a well-tested and constructed series of buzz words concocted by the marketing department. It’s an ethos that runs through the veins of every person building the scopes that might one day end up on one of your guns. And, as famous as Leupold’s Lifetime Guarantee may be, I’ll make my own guarantee here and now. If you’re an uncompromising hunter or shooter, and demand the best from yourself, the people around you, and the gear you buy, regardless of your budget, then look no further than Leupold. Records are not broken by chance. To raise the bar, it takes sheer will, grit, and plain old American-style hard work. 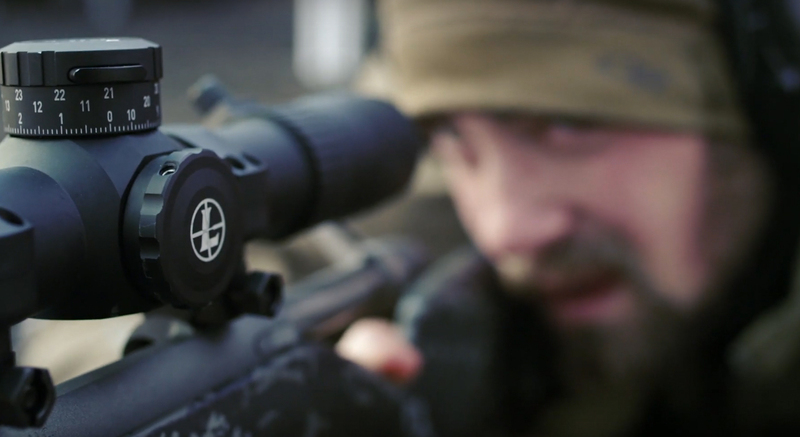 Founded in Oregon more than a century ago, Leupold is a fifth-generation, family owned company that designs, machines, and assembles its riflescopes, mounting systems, and tactical/Gold Ring spotting scopes in the USA. Leupold is proud to announce that in 2018, they manufactured more riflescopes in Beaverton, Oregon, than any year in company history. And they’ve been around for a while… so that’s saying something. Previous: Previous post: EP130: Wielding the Sword and the Pen with Marty Skovlund, Jr.